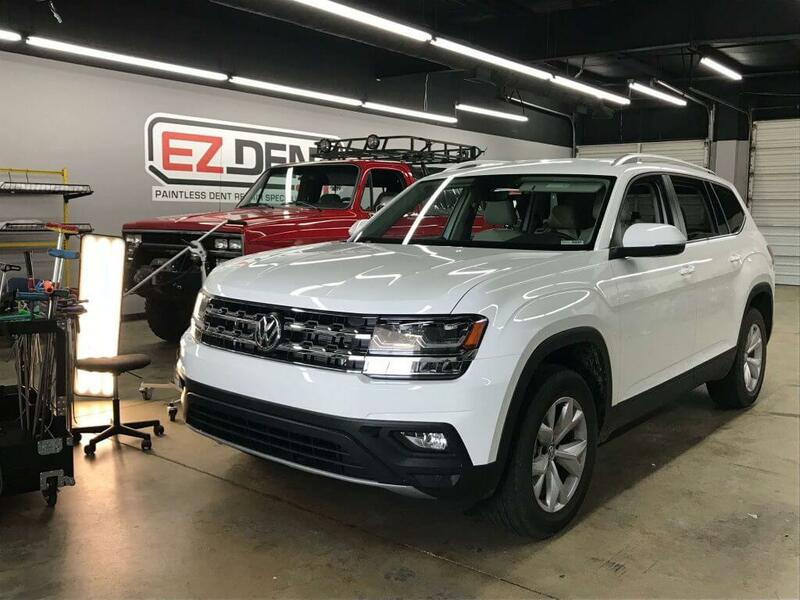 EZ Dent provides expert repairs for irregularities, bends, dings, and dents on the bodies of Volkswagen vehicles ranging from Touaregs and Tiguans to Beetles and Golfs. Serving Athens and Metro Atlanta, we use a cost-effective and quick process called paintless dent repair (PDR). Our Volkswagen (VW) dent repair & removal works by using tools that are specifically designed to slowly work the metal on the body of your car back into its original form. We perform the PDR process at your location. And, often times, we can finish up in under an hour, but times may vary depending on how many dents you have, how big they are, and where they are situated on your car. This is one of the first questions customers ask us when they get a dent in their Passat, Jetta, or other VW vehicle. Paintless dent repair is much less expensive than going to a body shop. And, though your repairs are likely going to cost less than your deductible, we are able to work with your insurance company. We can give you our expert advice on this once we see your car. The overall cost of the repairs will depend on several things, such as the make/model/year of your vehicle, where the dent is located, the type of dent, and where we have to travel to make the repairs. However, since dents are all that we do, we can beat the prices of body shops located in Athens, GA. We have perfected an affordable and efficient process to complete the work accurately and quickly. *Disclaimer – EZ Dent is not affiliated with Volkswagen or authorized Volkswagen dealerships. If you need dent removal and repair services for your CC, Eos, or any other Volkswagen regardless of body type, model, or color, we are here to help. Contact us for a free consultation.